I'm planning on entering my film Bethel: Community and Schizophrenia in Northern Japan to several ethnographic and documentary film festivals next year. I've been searching for information on places to enter, and here's the short list that I came up with. If you have any suggestions or comments, please send them in! Montreal Ethnographic Film Festival Jan 26-28 Nov 1 (2006) www.anthro.umontreal.ca/varia/ffem06/ (2006 festival). Submitted. Withdrawn. Portland Intl Film Festival Feb 5-17 Nov 15 (2006) Submitted. Dinged. Through Women's Eyes Feb 23-26 Nov 13 (2006) Submitted. Rejected. Reel Women's Intl Film Festival Mar 8-12 Nov 15 (2006) Submitted. Rejected. Ann Arbor Film Festival Mar 20-25 Nov 22 (2006) Submitted. Dinged. Full Frame Documentary Film Festival Apr 12-15 Nov 30 (2006) http://www.fullframefest.org/. Submitted. Dinged. Nashville Film Festival Apr 19-26 Oct 26 (2006) http://www.nashvillefilmfestival.org/. Submitted. Dinged. Brooklyn Arts Council May 5-15 Nov 22 (2006) Submitted. Jan 7 http://www.hkiff.org.hk/eng/events/entry.html. Did not enter. Apr 21 - 22 http://www.storiesfromthefield.org. Submitted. Dinged. Jun 27 - July 1 Jan 12 http://www.therai.org.uk/film/festival/index.html. Submitted. Dinged. Women's Independent Cinema Oct 1-31 Nov 22 (2006) Submitted. Seattle International Film Festival May 24-June 17 Submitted. Dinged. Society for Visual Anthropology Nov ?? March Submitted. Mental Health Film Festival (UBC) May 2008 ?? Continue reading Film: 2007 Ethnographic Film Festivals. I mocked up the DVD jacket cover for my forthcoming film, Bethel: Community and Schizophrenia in Northern Japan. Comments and thoughts more than welcome! Also, let me know if you or your organization would like to arrange for a screening. I'm doing several this semester. The film is still officially still in editing, I'm hoping to open it in January at a film festival. Canon USA and Canon Japan have announced that there is a new firmware upgrade for the Canon XL-H1 camcorder. Version 1.0.3.0 corrects issues with time-code synchronization as well as reducing the granularity of the manual iris control to 1/8 stop steps. 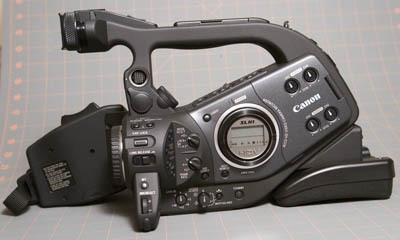 The firmware is available by either bringing the camcorder to a Canon center or by phoning them and asking them to send you the update on an SD card for free. It is not available by download. I phoned them and they are sending the new firmware by Fedex 2nd day. I'll post again when I've updated my unit. p.s. My camcorder, which is one of the first 100 made, was at version 1.0.0.0. I haven't been able to find out what the minor fixes between 1.0.0.0 and 1.0.2.0 (the last public version) have been. 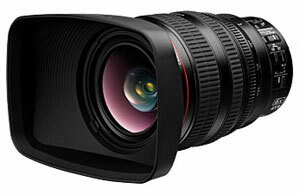 Canon has also announced a 6x wide-angle high-def lens for the XL-H1. The new Canon HD Video Lens 6x XL 3.4-20.4mm L has a 35mm equivalent perspective of 24.5 to 147mm, making it ideal for indoor videography. There's a manual iris control ring, which makes many people happy. Unfortunately, focus and zoom are still servo controlled which makes me unhappy. I had to dig around to find the maximum aperture, but it looks like it'll be f/1.6 to f/2.6. The price is quite reasonable at a MSRP of $3000. When it comes out in November, I want one. This is the lens that should have come with the camera, in my opinion. This page is a archive of entries in the Video category from October 2006. Video: September 2006 is the previous archive. Video: November 2006 is the next archive.